Is Your Amazon Business Ready for Voice Search? Have you been reading the same articles about Alexa that we have? If so, then you know that some big names are working on strategies to break into the voice purchasing arena. Now, if you use your smart speaker exclusively to listen to Spotify and turn off the lights once you're in bed, that’s cool, but you should try out some of the other features. Make it tell you a pirate joke or order your groceries. Alexa can be hilarious and very helpful in your everyday life. While Alexa is busy helping folks with everyday tasks, she’s changing the way consumers buy and search for products. In February 2018, OC&C published a report entitled “The Talking Shop” about the disruptive changes smart speakers are bringing to the market. Right now, voice shopping is a $2 billion market, but it’s on track to increase to $40 billion by 2022! Want a piece of that $38 billion increase? We can help! Hint #1. Alexa is also on mobile! 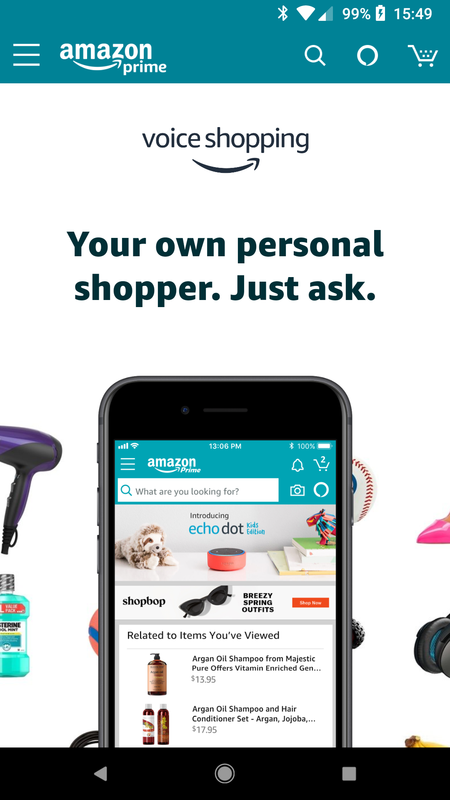 Customers with the Amazon app can shop with Alexa on their Android or iOS devices, and voice search is a far better user experience than typing on a smartphone. So while you may not think there are enough potential customers finding your products with a smart speaker, there are hundreds of millions of mobile shoppers. This is an important fact to keep in mind when crafting your product listings. A mobile shopper is voice searching, skimming, and scrolling, so pay attention to the length of your content and make sure it is formatted to highlight the main product details. Hint #2. Be the best you can be. Most of us probably aren't lucky enough to have an entire category named after our products (e.g. Band-Aid, Kleenex, Uggs), but you can strive to become a bestseller and an Amazon's Choice listing. So, what is “Amazon’s Choice” and why does it matter for Alexa? “Amazon's Choice” is a badge that gets displayed next to a listing Amazon recommends. You can find it in most of your Amazon searches, and it’s what Alexa will suggest when you order a product and don’t specify a particular brand. An Amazon's Choice designation cannot be sponsored or bought. Amazon bases it on three different metrics, which you can view by hovering your cursor over any Amazon's Choice badge. 1. A High Rating. Amazon is looking for an average product rating of 4.5 stars or above with a high number of reviews (think hundreds or thousands). Amazon also looks at your “Best Seller” rating, which OC&C’s research recommends be at eight or higher. For glowing reviews and high ratings, be sure to respond to customer inquiries quickly and have a product guarantee. These will contribute to keeping your return rate low and Best Seller Rating high. Happy customers make for a happy Amazon! 2. Well-Priced. Amazon does not want to surprise a customer with a big price tag after they’ve ordered through Alexa. For that reason, they lean towards prices and products on the lower end of the market. Make sure that your pricing allows for a profit margin but remains competitive with other “value” products in your category. 3. Available to Ship Immediately (and quickly). From what we’ve seen, it’s incredibly rare for Amazon to select a product for Amazon Choice that isn’t Prime eligible. Products that use Fulfillment by Amazon are far more likely to be considered. This is particularly important, as slow shipping time is one of the main reasons listings lose their “Choice” status. Listings have also lost their status due to low inventory, so you have to be consistently well-stocked. It’s important to note that meeting all of these qualifications doesn’t mean you’ll automatically receive the Amazon's Choice badge for your listing, especially if there’s a competing AmazonBasics product as these will always be the first choice. However, it will put you in consideration. And by taking these steps to improve your listing, you’ll be attracting more customers and sales, which increases your chance of obtaining the “Choice” designation even further. Your chances are greater still if your customers love what you're selling and leave some five-star reviews. Remember, as more people use Alexa and other smart speakers to make purchases, you’ll continually need to update your listing and keywords. As always, MerchantWords is here to help! Check out our keyword database or sign up for Listing Advisor and let us help you optimize your listings and PPC campaigns!